SALE! For a Limited Time, Save $8 Off Absorbine Hooflex Magic Cushion 8lb Instantly! While Supplies Last. 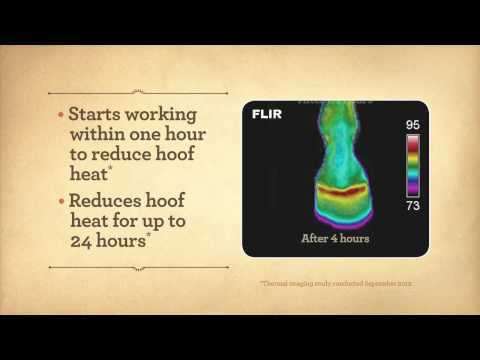 Magic Cushion® hoof packing helps support hooves in several ways, including relieving sole bruising and post-trimming soreness, treating abscesses, and fighting bacterial and fungal infections in the hoof. It can be used as needed, or packed under a shoe and pad and left in place through the shoeing cycle. Note: Product is undergoing a rolling packaging change, so product received may look different from image shown. This product wasn’t that difficult to deal with - just use a plastic glove - and was extremely effective. Pack the foot with the product and then press shavings into the packing and it stays in place quite well for at least 24 hours. Amazing!! I’ll never go without it in my barn again! Magic cushion is wonderful for packing feet and drawing out inflammation and soreness. Farrier recommended, barn recommended. Use this on all my show horses at horse shows. use it at home too. Excellent at taking out any hoof soreness. My horse would get pretty sensative on his feet after getting his feet done or riding on hard surfaces. This product really helps make his feet feel better and never go to a show without it. The only flaw is, it does not come off you hands so I would recommend using gloves when applying. Statelinetack has the best price too! Best stuff out there to help with sore feet! Works great as treatment or preventative for sore feet! We use this procduct after hunter/jumper shows. We feel it's like getting a foot massage for the horse after a long day of work. This product is messy, so use rubber gloves. It is also made in pads, which is fantastic without the mess, just more expensive. I have used this product for several years on my mare and pony. The pony has maximum rotation of P3 and the mare has mild rotation from 3 laminitic episodes over the past 6 years. I use about a tablespoon of Magic Cushion followed by a cardboard "plate", baby diaper, and then the boot (or you can use duct tape). She wears this for 2-3 days before I renew the Magic Cushion. I find it useful for any general soreness. The pony was chronically foundered when I got him, but I believe it does help to give him some relief occasionally, too.One container will last a long time. The main component is shredded leather. If it becomes thick, I stir in more turpentine. It's messy stuff, so I wear latex gloves to apply. Also, if you are allergic to turpentine, take precautions for yourself, and for the horse, avoid putting so much on the hoof that it slips up the heel and gets into the hair. I haven't had any raw skin problems on the horse, but it's possible and should be avoided. My trainer used this on my horse last summer that we showed in Venice, it definitely helped him. I just bought it since we will showing again in Venice. My horse had a sub liner abscess which was bad but not as bad as I heard they can be by my farrier. I soaked my horses foot and then placed Xtreme Magic cushion at the sole and on the frog of her foot. I then wrapped with vetrap and then added a baby diaper. I then placed her foot in a RX boot for 2 days. The improvement was magical. It still took several weeks for her abscess to heal, but she could walk without limping with the magic cushion and boot. My horse is now all healed. Thanks Magic Cushion. Love magic cushion...use after trims for those who tend to be a bit tender footed or the soft soled horses! We use Magic Cushion on our horses at shows that are prone to get sore and it works like Magic! Love this stuff! Well worth the price! I use this a couple of times a year when I take my horses to the mountains where the terrain can be rather rocky and it greatly reduces soreness! Very quick and easy to use too! My farrier said this is the best for abscesses. I like and use this product on a regular basis. Recommended by my vet for sole soreness. This will be my first time using it. My horse is suffering from abscesses that have ruptured and I want to make sure the tracks are kept clean from future abscesses. My horse is sore on his front feet from stomping. this works so well and my horse loves the way it feels. This is by far the best product for sore feet. Magic Cushion helped get my mare through laminitis last year. I will never be without it. My vet suggested this product. the best hoof packing I have ever used. If correctly packed - the hoof packing will stay in for days: my horse gets turnout daily, but the hoof packing will stay in until I pick his hooves. It seems to keep my horse comfortable even when showing at a venue with terrible footing; his feet do not get dry, and he does not get foot sore. . Saved a lot at shoeing time. seems to work very good at thrush control. Hoof soreness and this product was highly recommended by equine chiropractor. It's really quite easy to use however it depends what you need it for. I use it when my farrier occasionally trims my barefoot horse too much & the result is my horse becomes too sore to walk without limping on hard surfaces. I apply it in his stall for his comfort overnight. I clean his feet really well first then I - while wearing plastic gloves - scoop out the magic cushion and form a small ball. The size is dependent on the hoof- larger than a golf ball but smaller than a baseball. While holding up your horses leg place the ball on frog away from toe- closer to the heel. Then place the heel of your hand - on the ball of magic cushion & push down hard enough to squish the product in to the foot & roll the up the palm of your hand. The product should slightly ooze over hoof & don't be concerned about having a little too much. Then I put a layer sprinkled of the dry stall flooring over the it- we use watered down wood pellets in our stalls. This eliminates the product from coming out by sticking to the floor. Now you can release your horse's leg and his own weight will finish squishing it in his hoof - & ooze out any excess. It stays inside the hoof & hardens overnight- & then he goes out the next morning to his pasture. The product will work its way out so there's no need to worry about removing it. Also, it is antibacterial so if its really wet you can apply this to avoid fungal infections, abscess or thrush. I hope this helps you. Definitely wear rubber gloves as this packing takes very long to come off your hands! Have the packing container right next to you, and you first pick the hoof and brush out any dirt, etc. then take a clump of packing, just a little more than the size of a golf ball, and roll it in your hands into the shape of a ball. Put that right on the frog and spread over the whole underside of the hoof. You'll also need sheets of paper/magazine the size of a hoof to cover the packing with and you lay the paper flat over the packed hoof, squishing it down onto the packing, so that the packing stays inside the hoof. Then just use a hoof pick to pick the packing out the next day! I take about a 1/4-1/2 cup worth, wearing gloves as it is very sticky, and spread over clean hoof. Have a diaper or some duct tape ready to cover and I either vet wrap or duct tape it on the foot. When conditions are right, it can last for a couple days and repeat. Works well for bruises, cracks on bulbs of foot, etc. Make sure you wear gloves and you just pack the bootom of the hoof. I like to pack mine and put them up in the stall afterwards or you can put some boots on and turn them out. Pack after or before workouts. You pack the hoof, cover with plastic warp then make a vet wrap or duct tape boot. Make sure you wear gloves because it is so sticky and doesn't come off. Also use pants you don't really care about. When I used it before, I would pack it into the hoof, then cover with a layer of wax paper, then wrap with vet wrap and duck tape.